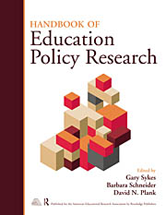 Editors: Sykes, Gary, Schneider, Barbara and Plank, David N.
Drawing from multiple disciplines, the Handbook's over one hundred authors address three central questions: What policy issues and questions have oriented current policy research? What research strategies and methods have proven most fruitful? And what issues, questions, and methods will drive future policy research? Topics such as early childhood education, school choice, access to higher education, teacher accountability, and testing and measurement cut across the 63 chapters in the volume. The politics surrounding these and other issues are objectively analyzed by authors and commentators.